THAT L.A. IT GIRL: Caché Stores Closing Sale Going On Now! 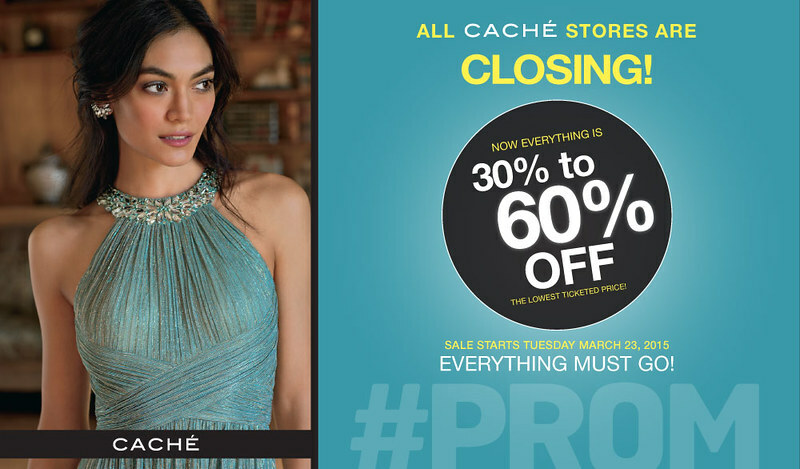 Caché Stores Closing Sale Going On Now! Hey guys! So if you didn't already know Caché is having a huge sale, they are closing their doors for good. What does that mean for you? That means that everything in the store will be on sale! And who doesn't like a good sale? This is a system wide liquidation sale. Currently, discounts are 30%-60% off, but will get better as the sale period goes on. Updates and content are available on their Facebook facebook.com/cachestyle, Instagram and Twitter. Customers can take an additional 20% off the existing discounts of 30-70% today! I know I'm going to be on the lookout for this simple outfit. For some reason, I've been really into color blocking outfits lately! And come on, can't you see me in this style? If you want to know if there's a Caché store near you, check out their locator. Currently today there are several stores in SoCal that are closing, but majority of the stores will be closing in April! So check out their Facebook page to make sure you get the best deals!